These days I have been a little preoccupied with the Vintage Game Club, courtesy of The Brainy Gamer. Consequently, I have been paying more attention to the latter, a blog for gamers who also like to think about the games they play. That's something I've been doing for a very long time. The most recent post on that blog talks a bit about the highly anticipated title Spore, and the press it has garnered. Though I am not sure when I'll get to enjoy this game, the post does bring up important issues with the current game journalism system. As someone who used to work for Gamestop, I am all too familiar with how game journalism fits into the commercial scene. It does a good deal of swaying people's opinions about what they should buy and what they should pass up. 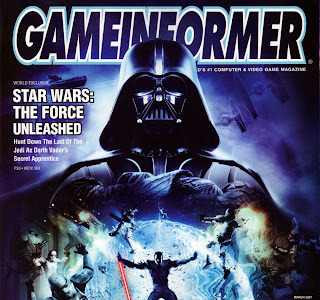 Interestingly enough, Gamestop's most popular magazine is Gamer Informer. They tend to sell that magazine above all others, for the very obvious reason that the company owns Gamer Informer. Over the years this has lead to the retailer casting aside other major publications, or carrying them to simply generate the image of choice and competition (just try to buy a magazine other than GI at those stores). "The magazine has nearly 3 million subscribers according to Andrew Reiner, making it the highest circulated video game magazine," (link). I would venture to guess that major game companies which have ties to Gamestop also exert some manner of influence over information published in the magazine in order to bolster sales of their product, while smaller developers tend to get less favorable treatment, or get omitted entirely. The point is that I personally never paid much attention to game journalist's opinions on what is good or bad. My own experiences have only reinforced this doctrine, and never was it more useful than during the days of the Dreamcast. Game after game on that system broke my preconceptions of genres and styles, and I loved it. Meanwhile, reviews for so many titles on that platform left a lot to be desired. What's more, my fellow Gamestop colleagues were often very unimpressed by the same games which I felt to be fresh, innovative, and, most importantly, very enjoyable. I felt that some of them had been conditioned by the commercial environment which surrounded us to hold bias similar to that of the game journalism community. Some examples of titles on the Dreamcast which got less favorable marks include D2, Illbleed, Industrial Spy, Omikron, and Star Wars (Ep1) Racer. These games were at best groundbreaking and innovative, and at worst quirky and but still a lot of fun.